Rahul Dev Verma, Manish Katiyar,Urvashi Verma,Gitanjali Sharma, Anju Shrivastava, Abhimanyu Kumar Jha (2014)Demethylation of Promoter Region of FHIT Gene in A549 Cell Line by Sweet Potato Leaf Extract. International Journal of Applied Biotechnology and Biochemistry. Vol.4:2 pp. 125-131. Gosain A, Srivastava, A. and Saran S. (2014) Peptide: N- glycanase is expressed in prestalk cells and plays a role in the differentiation of prespore cells during development of Dictyostelium discoideum. Indian J Exp Biol. 2014 Mar;52 (3):197-206. Kavya Venkateswaran, Amit Verma, Anant N. Bhatt, Paban K. Agrawala, Hanumantharao G. Raj, Shashwat Malhotra, Ashok K. Prasad, Olivier De Wever, Marc E. Bracke, Luciano Saso, Virinder S. Parmar, Anju Shrivastava and B.S. Dwarakanath (2014) Modifications of Cell Signalling and Redox Balance by Targeting Protein Acetylation Using Natural and Engineered Molecules: Implications in Cancer Therapy. Current Topics in Medicinal Chemistry, Vol: 14: 22 Pages 2495-2507 (13) DOI: 10.2174/ 15680266 14666 1412031 22005. Banergee C., Singh A., Gosh T.A., Raman R., Shrivastava A. and Majumder S. (2014) Ameliorating ER-stress attenuates Aeromonas hydrophila-induced mitochondrial dysfunctioning and caspase mediated HKM apoptosis in Clarias batrachus Scientific Reports, 4: 5820. Bhakta G., Nurcombe V., Maitra A. and Shrivastava A., (2014)DNA-encapsulated magnesium phosphate nanoparticle elicit both humoral and cellular responses in mice. Results in Immunology 4: 46–53. A.K. Jha, M. Nikbakht, G. Parashar, A. Shrivastava, N. Capalash, J. Kaur (2010)Reversal of Hypermethylation and Reactivation of the RARβ2 Gene by Natural Compounds in Cervical Cancer Cell Lines. Folia Biologica (Praha) 56, 195-200. Puja Chauhan, Ajit Sodhi and Anju Shrivastava (2009) Cisplatin primes murine peritoneal macrophages for enhanced expression of nitric oxide, proinflammatory cytokines, TLRs, transcription factors and activation of MAP kinases upon co-incubation with L929 cells. Immunobiology, 214,197-209. Bhakta G., Shrivastava, A., and A. N. Maitra (2008) Magnesium Phosphate Nanoparticles can be Efficiently Used In Vitro and In Vivo as Non-Viral Vectors for Targeted Gene Delivery. Journal Biomedical Nanotechnology, Vol.4, 1–9. 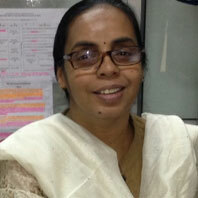 Anju Shrivastava, (2007) Activation of Macrophages with N-formyl-methionyl-leucyl-phenylalanine: Involvement of Protein Kinase C and Tyrosine Kinase. Indian Journal of Experimental Biology, 45, 755-763. Sunil K Raghav, Bhawna Gupta, Anju Shrivastava, Hasi R. Das, (2007) Inhibition of lipopolysaccharide-inducible nitric oxide synthase and IL-1 β through suppression of NFkB activation by 3-(1´-1´-dimethyl-allyl)-6-hydroxy-7-methoxy-coumarin isolated from Ruta graveolens L. European Journal of Pharmacology, 560, 69-80. Chen, Y-R., Shrivastava, A. and Tan, T-H. (2001) Down-regulation of c-Jun N-terminal kinase (JNK) phosphatase M3/6 and activation of JNK by hydrogen peroxide and pyrrolidine dithiocarbamate. Oncogene, 20, 367-374. Shrivastava, A. and Aggarwal, B.B. (1999) Antioxidants Differentially Regulate Regulation of Nuclear Factor-kB, Activator Protein-1, C-jun Amino Terminal Kinases, and Apoptosis Induced by Tumor Necrosis Factor: Evidence that JNK and NF-kB Activation Are Not Linked to Apoptosis. Antioxidants & Redox Signaling 1: 181-191. Haridas, V., Shrivastava, A., Su, J., Yu, G.L., Ni, J., Liu, D., Chen, S.F., Ni, Y., Ruben, S.M., Gentz, R., Aggarwal, B.B. (1999) VEGI, a new member of the TNF family activates nuclear factor-kappa B and c-Jun N-terminal kinase and modulates cell growth. Oncogene 18: 6496-6504. Singh, R.A., Zang, Y.C., Shrivastava, A., Hong, J., Wang, G.T., Li, S., Tejada-Simon, M.V., Kozovska, M., Rivera, V.M., Zhang, J.Z. (1999) Th1 and Th2 deviation of myelin-auto reactive T cells by altered peptide ligands is associated with reciprocal regulation of Lck, Fyn, and ZAP-70. J. Immunol. 163: 6393-6402. Shrivastava, A., Manna, S.K., Ray, R. and Aggarwal, B.B. (1998) Ectopic expression of hepatitis C virus core protein differentially regulates nuclear transcription factors. J Virol. 72(12): 9722-8. Shrivastava, A. and Aggarwal, B. B. (1998) Cytokines as biological regulators of homeostasis. Shrivastava, A., Shishodia, S. and Sodhi, A. (1998) Expression of LFA-1 adhesion molecules on cisplatin-treated macrophage. Biochemica Biophysica Acta., 1402: 269-276. Ray, R.B., Meyer, K., Steele, P., Shrivastava, A., Aggarwal, B.B. and Ray, R. (1998) Inhibition of tumor necrosis factor (TNF-a) mediated apoptosis by hepatitis C virus core protein. J. Biol. Chem. 273: 2256-2259. Shishodia, S., Shrivastava, A. and Sodhi, A. (1998) Involvement of Ras and MAP kinase (ERK-1) in cisplatin-induced activation of bone marrow-derived macrophages. Biochem. Mol. Biol. 527-534. Shishodia S, Sodhi A, Shrivastava A. (1998) Role of calcium/calmodulin in cisplatin-induced activation of murine bone marrow-derived macrophages. J. of Clin. Biochem. and Nutr., 24: 1-12. Shishodia, S., Shrivastava, A. and Sodhi, A. (1998) Protein kinase C: a potential pathway of macrophage activation with cisplatin. Immunol. Letters 61: 179-186. Ranjan, P., Sodhi, A and Shrivastava, A (1997) Cisplatin induced apoptosis in murine macrophages: role of TNF and nitric oxide. Anticancer Drugs 1 8: 797-806. Shishodia, S., Shrivastava, A. and Sodhi, A. (1997) Cisplatin stimulated murine bone-marrow-derived macrophages require protein tyrosine phosphorylation. Int. J. Immunopharmacol. 19: 683-690. Sodhi, A., Shishodia, S. and Shrivastava, A. (1997) Cisplatin- stimulated murine bone- derived macrophages secrete oncostatin M. Immunol. and Cell Biol. 75: 5. Singh, S.M., Parajuli, P., Shrivastava, A. and Sodhi, A. (1997) Alteration in immune response by tumor cells: underlying mechanism. Int. J. Immunopathol. Pharmacol. Pai, K., Shrivastava, A., Kumar, R., Khetarpal, S., Sarmah, S., Gupta, P. and Sodhi, A. (1997) Activation of murine macrophages by chemotherapeutic drugs. Life Sciences, 60: 1239-48. Singh NK, Singh A, Sodhi A, Shrivastava A. (1997) Synthesis, characterization and in vitro antitumor activities of binary and heterobimetallic complexes of oxovanadium (IV), manganese (II), iron (II, III), cobalt (II, III), nickel (II), copper (II) & zinc (II) with p-hydroxy dithiobenzoate. Ind. J. Chem. 36: 992-997. Singh, N.K., Singh, A, Sodhi, A. and Shrivastava, A. (1997) Synthesis and characterization of binary and heterobimetallic complexes of dithiofuroate with 3d- metal ions. Transition Met. Chem. 22. Shrivastava, A., Shishodia, S. and Sodhi, A. (1997) Activation of Murine peritoneal macrophages and macrophage cell lines P388D-1 and IC-21 with cisplatin. Int. J. Immunopathol. Pharmacol. 10: 13-21. Singh, N.K., Singh, N., Prasad, G.C., Sodhi, A. and Shrivastava, A. (1997) Anti-activity studies of newly synthesized N-Salicyl-N'-p hydroxythiobenzohydrazide and its copper-(II) complex in vivo and in vitro. Bioorganic and Medicinal Chemistry 5: 245-251. Singh, N.K., Singh, N., Prasad, G.C., Sodhi, A. and Shrivastava, A. (1996) Synthesis characterization and anti-tumor studies on N-Salicyl-N' thiobenzhydrazide and its copper (II) complex. Transition Met. 21: 1-4. Sodhi, A., Shrivastava, A. and Kumar, R. (1995) Induction of protein tyrosine phosphorylation in macrophages incubated with tumor cells. Biochem. and Mol. Biol. Int. 35: 559-565. Kumar R., Shrivastava, A. and Sodhi, A. (1995) Cisplatin stimulates tyrosine phosphorylation in macrophage. Biochem. and Mol. Biol. Int. 35: 541-547. Shrivastava, A., Sodhi, A. and Kumar, R. (1995) Activation of Murine macrophages by tumor cells. Int. J. Immunopathol. Pharmacol. 8: 45-56.